I love food. I don’t really consider myself a “foodie”. Mostly because I’m not even sure what that word means. What I can tell you, though, is that my daily eats are FAR different from my peers.I try to eat mostly organic and whole foods. They make me feel best and give me the most energy. And while I love the foods I eat because they are delish, food is really just energy. Lets just get the obvious out of the way first. I don’t eat anything that used to have a face. Why do I say it like that, you ask? Because when people learn that I’m a vegetarian, 7 out of 10 ask me if I eat fish. No. They have a face. Now that we all understand that: I lerrrrrrrve me some fruit and veg action. Hand held, portable, delicious, and nutritious. What more could you ask for? In my humble opinion, bananas trump all fruits and tomatoes trumps all veg. No, I don’t care that tomatoes are botanically a fruit. I call them vegetables. As for protein, (which most people are concerned about the minute they hear the word ‘vegetarian’, though I’m not really sure why seeing as I’m partial to carbs and FATS baby) I eat whole grains, seitan, beans, greek yog, cheese and nuts. With all of those sources, I’m confident that I get plenty of protein each day. I love carbs and grains. Oatmeal, barley, Alvarado St. Bakery bread, wheat berries, farro, millet.. carboliciousness. Fats deserve their own paragraph. I. Love. Fats. Fats do not a fat person make. Get it through your heads people. 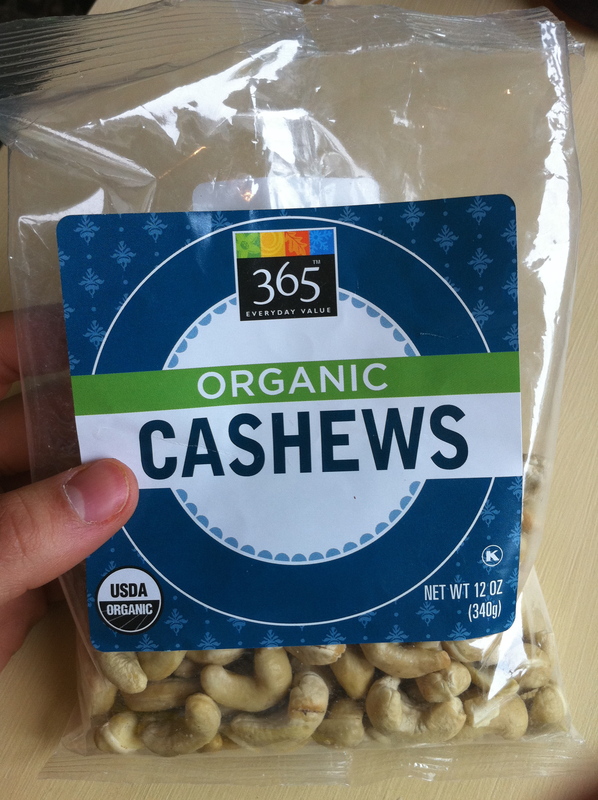 My favorite fats are cashews. I eat many servings of cashews EVERY SINGLE DAY. A handful here, a handful there, there and there..
2/3 of the way empty in 2.5 days. Totally normal..
Mmm…I love Alvarado St. Bakery bread too! It’s very close to where I live actually. Love your paragraph on fats! I feel the same way. :) I also like your description of vegetarian by nothing that has a face. That’s a great way to explain it to people. I most definitely agree! I LOOOOOVE cashews, almond butter, and avos! I’m glad i found ur blog!